One of my apprentices had a severe histamine reaction which caused hives on her bactrimsale arm. She applied bruised plantain and nettle tincture to the affected area and within 5 minutes, the hives receded. Now that’s fast acting herbal medicine! Both plantain and nettles are best used fresh. Nettles are very effective fresh tinctured, however, plantain is best fresh juiced. Tincturing and drying markedly reduces plantain’s antihistamine action. To preserve plantain juice, freeze in ice cube trays or add 20% by volume 151 vodka. Herbal juice preserved this way is called a succus. Store the succus in the fridge for up to a year. To apply the succus or tincture, generously soak a cloth or paper towel and apply as a compress to the affected area and just beyond. The compress may be reapplied several times until relief is 100%. The succus and tincture may be taken internally as well. For mild to severe allergic reactions, up to 4 dropperfuls of nettle tincture and/or a couple ounces of succus can be taken. In an anaphylactic shock situation, please use common sense. These remedies may be taken on the way to the hospital. 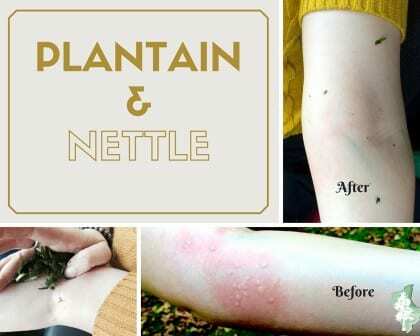 While taking enough of nettle and plantain may eliminate the anaphylactic shock, there is the chance that they simply will buy time in order to get to western medicine help.